I don’t know about you all, but we’re still making our way through some hot weather here in Southern California—whew-wee! Can we please be done with this? Where are the temperatures that beckon for me to wrap myself in a comfy-cozy blanky, or throw on a jacket or sweater when I go out in the evening? They seem to be hiding at the present moment, that’s for sure. So it makes it just a wee-bit less appealing to turn on an oven for the time being (only a wee-bit less, mind you), but you know what? I’m not going to let it stop me. Especially if it’s for a quick 20-or-so minutes, and what comes out of said oven is a healthier, guilt-free twist on some snacky-comfort food that I’m gonna love popping into my mouth! We love crispy chicken tenders or chicken fingers in our household, as they’re just such a simple little pleasure. Typically, we like to fry our strips, like we did with this out-of-this-world recipe for Coconut-Crunch Chicken Strips with Honey-Mango Dipping Sauce, or these Crispy Chicken Stix with 3 Dipping Sauces. 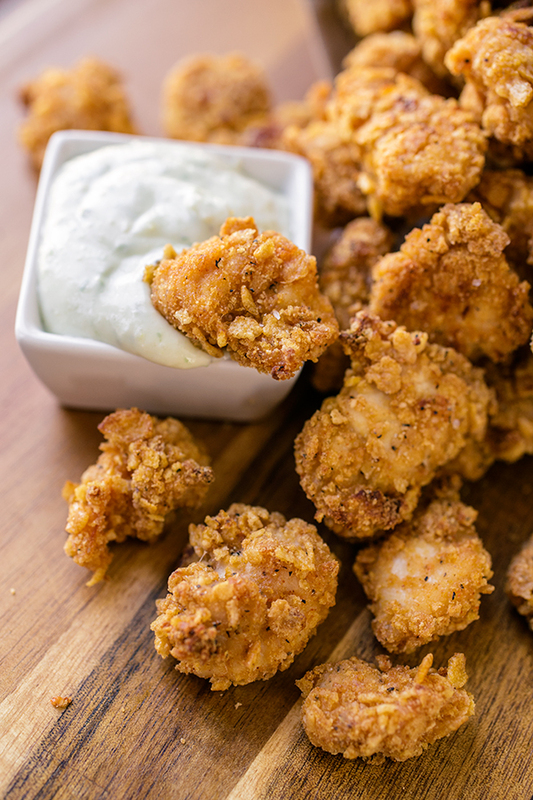 But this time, I wanted some “poppers” that I didn’t have to heat oil for, and so this recipe for Crispy-Baked Garlic “Popcorn” Chicken with Parmesan-Ranch Dipping sauce seemed like just the ticket! 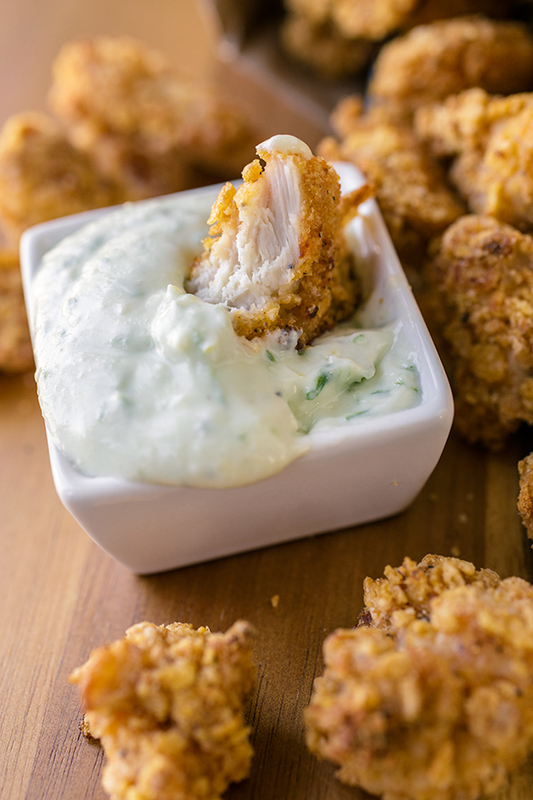 A savory and flavorful outer crispy crust surrounding juicy and garlic-marinated bite-sized pieces of chicken is what I was after, along with a creamy and zippy sauce to plunge them into—ideal for big and little fingers, alike. And since they’re not fried, doesn’t that automatically mean we can eat more?! Hey, hot weather: you’ve never stopped me from flippin’ on my oven before, and you’re certainly not gonna stop me now. 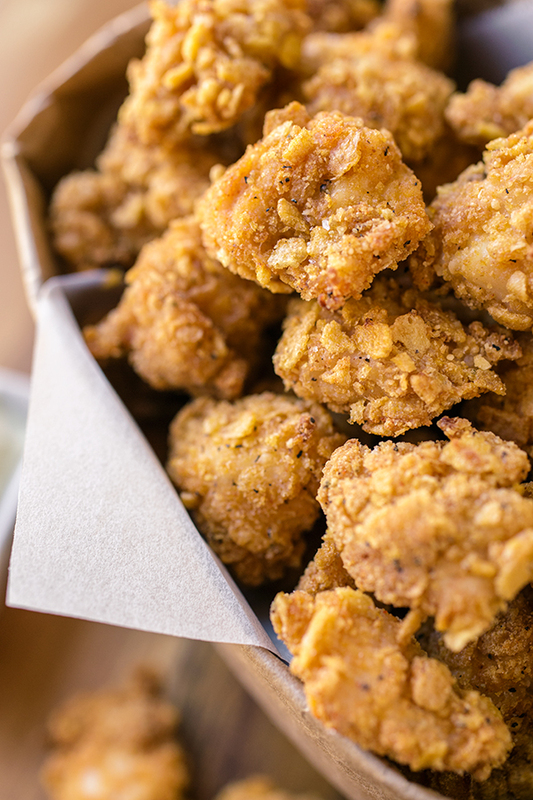 Looks like it’s time for me to pop up some “popcorn” chicken, in that case! -Preheat your oven to 400°, and line a baking sheet with foil. -Add the diced chicken pieces into a medium-size bowl, and add to it the garlic, ¼ teaspoon of the salt, and pinch of black pepper; toss together to combine, and marinate the chicken while you prep the rest of the ingredients. -Add your flour to a large ziplock bag, and set aside. -Add the cornflakes, parmesan, paprika, ¼ teaspoon of salt, ¼ teaspoon of black pepper and granulated garlic to the bowl of a food processor, and process just until a fine crumble (not too fine and powdery, but not too chunky); add that mixture to another large ziplock bag, and set aside for a moment. 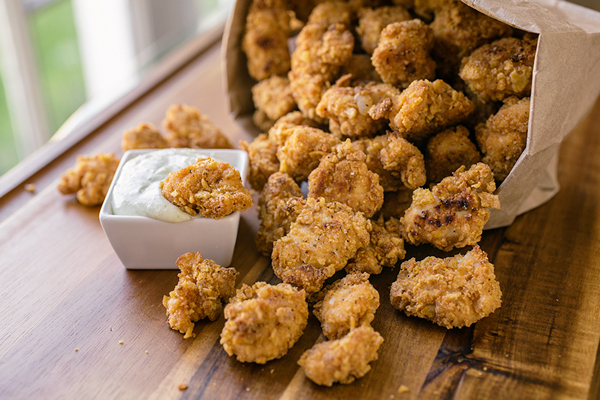 -Add your chicken pieces to the bag with the flour, and shake to coat the pieces well. 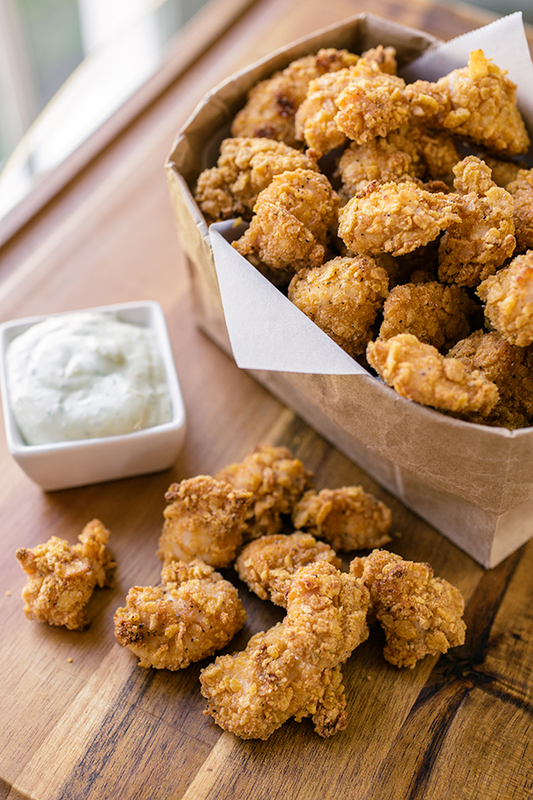 -Place the flour-coated pieces into a medium-size bowl, and drizzle over them the buttermilk; using your fingers, mix the buttermilk gently into the chicken, just to coat it. 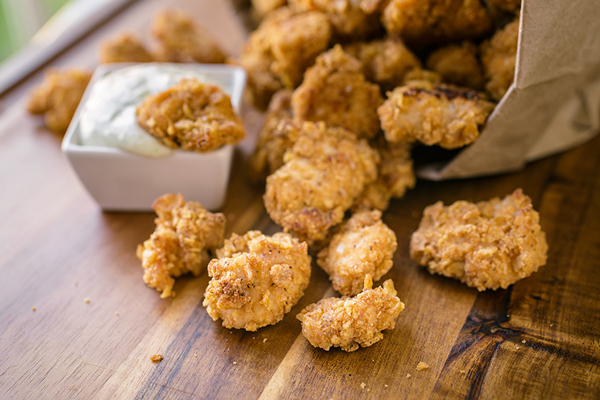 -Take the buttermilk-coated chicken pieces and add them to the ziplock with the corn flake mixture, and shake to coat the pieces well. 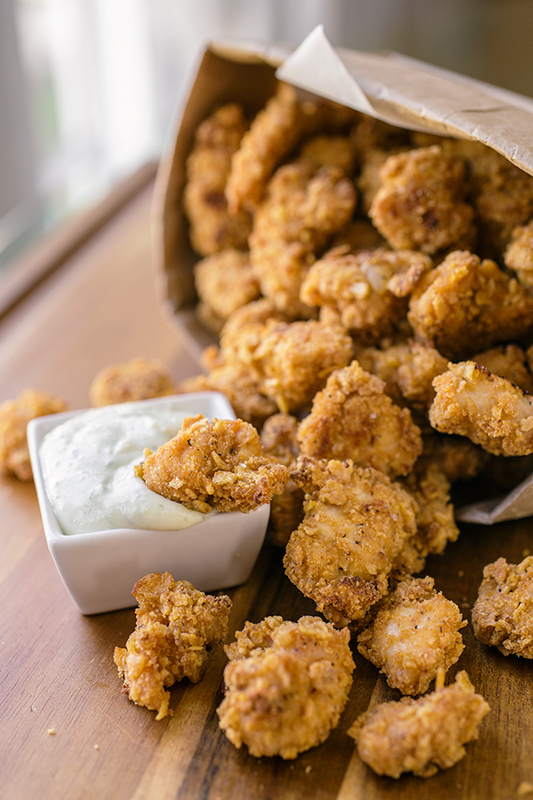 -Place each piece of coated chicken onto the foil-lined baking sheet in a single layer, give them a light misting of the cooking oil spray, and bake for 20 minutes; then, turn on your broiler, and allow the popcorn chicken to become extra crunchy by broiling for 2 minutes more. -Serve warm with the Creamy Parmesan-Ranch Dipping Sauce. -Add all ingredients to the bowl of your food processor, and process until completely smooth and blended; serve immediately, or keep covered in fridge until ready to serve. 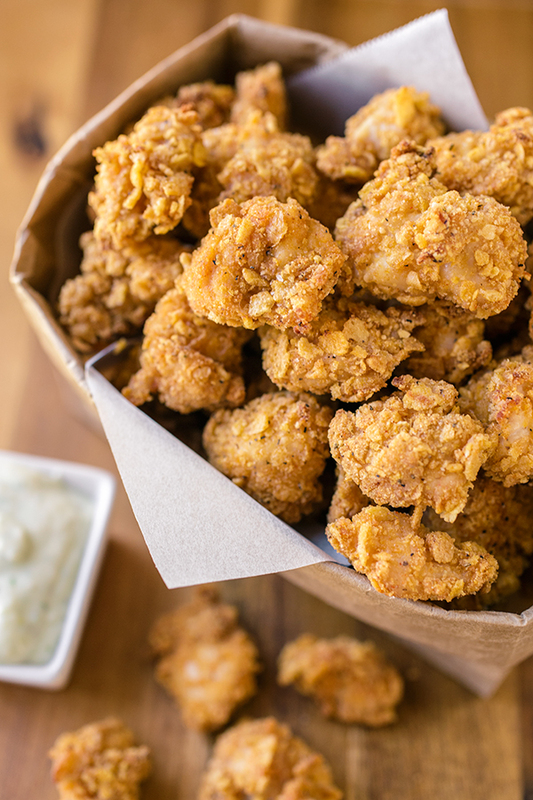 My husband loves getting popcorn chicken all the time! Will try this recipe for sure! Hi Ami, that’s great! It’s got a healthier twist, but with the flavors, I don’t think your husband will miss that they’re not the typical fried variety. Thanks for stopping by! Ingrid… these look AWESOME. I never know what to do with tenderloins. I’m going to have to try this soon. And they are baked? Ah, it’s love. Hey Sarah, thanks! And now you know how to use those tenderloins, haha! 🙂 Hope you enjoy, and thanks for stopping by for a peak. Made these for dinner tonight. Absolutely delicious! 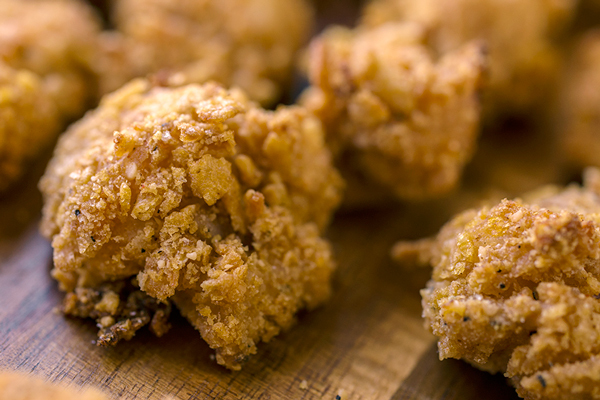 Just as good as deep fried – but much healthier and no mess! Kristi, that’s great! So excited that you enjoyed these, and had success with the recipe. Thanks so much for stopping back to comment! Did you use fresh parmersean?! Hi Bronwyn, if you have fresh grated parmesan, than definitely use it! Fresh is always best, but either will work for this recipe. These look great! I usually deep fry them and toss them in along with some salad so that it changes things up from your usual chicken breast salad, but I might have to try them baked. Seems healthier too! Do you hope try these, Amy! One of my son’s favorite meals, so I will definitely be trying this healthier version. Is there something else to use instead of buttermilk? I really don’t like using it. Do you have any suggestions for a substitution for the corn flakes? I’m allergic to corn but really want to put these in my face. Hi Junco, you can substitute panko breadcrumbs for the cornflakes, if you’re allergic; it may not be quite as crispy, but I think that would be the best (and tastiest) substitute. Now go put some of these in your face! Hi there…these look awesome. Would I be able to prepare them in advance and freeze them prior baking? Hi Maria, my only concern is that the coating will not hold up well. These truly are best prepared and baked off fresh, for crispy results! Hello! I saw this recipe on Pinterest and made it today. I substituted the salt with low-sodium soy sauce in the marinade and taste-wise this chicken popcorn taste great! My concern though is the chicken turned out dry. I followed the recipe exactly except for the soy sauce substitution. Also, I used skinless chicken breast. I wonder if my oven is too hot or I should’ve baked it less than 20 minutes. Made this last night and it was delightful! My Fiance loved it. So happy I ran across your website on Pinterest. Can’t wait to try out your other recipes! Hi Amanda, so happy to read that! 🙂 I’m glad you found us, too—hope you peruse and find more recipes to try out and enjoy! What flour should I use? Hi there, all-purpose flour is fine! My kids loved this recipe but I had a little problem when I dropped the creamy chicken in the corn flakes bag; the chicken pieces stuck to each other forming lumps and I had to break them apart and return them into the bag by hand numerous times, what have I done wrong ? Have you tried freezing the leftover chicken for future meals? How did they hold up? Hi Amy, I didn’t—we’ve never had any left over, lol! I’m not sure these would taste quite as good and crispy when frozen and thawed as they are when freshly prepared; it just think this is one of those recipes that should ideally be enjoyed the day of. This recipe is a dream. When I originally saw the picture on Pinterest, I was sure they were fried – to find out they are baked was delightful in and of itself! Thank you, Jenny! Hope you enjoy! I have made these twice now for myself, 18 month old son, and chicken wing loving husband. They are such a hit!! They will become a regular in our house. By far the BEST healthy, baked chicken recipe I have ever made. And as a dietitian, not only do I approve but LOVE!! These look delicious!! I can’t wait to try these… I’m hoping the kids will enjoy them to. Thank you, I hope they enjoy them, too! Hii!!! This recipe looks awesome!! I want to know if there is any way to replace the butermilk and use another ingredient because of alergy. Maybe margarine? Thank u so much. Hi Linda! If it’s a dairy allergy, I would substitute almond milk, or your choice of non-dairy milk; otherwise, you could use regular milk. But margarine would not be the best substitution, in my opinion. Hope that helps! Hi Barbara, you made my day with your precious (and gregarious) comment! I’m absolutely thrilled you enjoyed the recipe so much. You reminded me of just how tasty this recipe is, and now I’m craving it, lol…I think I’ll be preparing it again soon, myself! Thanks for sharing your experience with me.